usually ships within 1 to 3 business days. Canada only. Our philosophy for travel is simple: Make it easier to organize and pack your gear when travelling so that you can spend more time enjoying your experience. No matter your packing style or destination, our comprehensive line of curated travel solutions has something for everyone. Traveling to Russia for business? The Garment Folder will keep your shirts fresh and clean. More of a shirt roller? No problem, packing cubes are your answer (also for undies and such). Do your workout clothes smell like a yeti? Boom, Double Sided Packing Cubes. Need something to carry to the beach when you arrive? Stuff Tote is your jam. Whatever your activity, destination, or style, we have your needs covered in spades. Join Our Mailing ListYour Adventure Begins Here !! get access to the latest updates on new products, sales, and special killer deals. 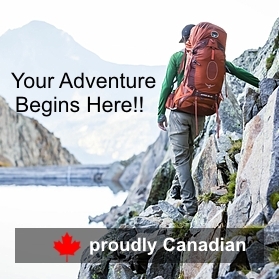 Get up-to-date trail conditions, weather and other useful information on Canada"s National and Provincial Parks. A directory of local and international web sites related to environment and environmental protection. The backpack is quite amazing. Exactly has I thought, plus it shipped really fast. I'd order from this website again. I'm going to Europe this summer for 3 weeks and the 40L is exactly what I need. The fact that it opens like a suitcase is the greatest thing ever. You can reach for anything really quickly. I would have loved a side pocket on the lowest strap for a bootle of water or something but overall this bag is #1 !!!! This was my first order from Outter Limits, and I am very impressed with its pricing, customer service, and friendly Saskatchewan attitude. The order was processed immediately, shipped promptly, and delivered early to the West Coast. Thank you for the superb service. You have my highest recommendation..
Something wrong with our site?